I want to start a LinkedIn group where people can get together and talk about best practices in presentations. What makes a good presentation? How can you solve a presentation problem that’s been bothering you? What presentation techniques increase sales or engage an audience? But I can’t think of the right name. I just know that I want “presentations” and “PowerPoint” to be in the title. Please take a quick poll and help me. LinkedIn help says I can share this link with anyone, but let me know if you don’t have an account and can’t access it. Click here to access the poll/survey. Results of survey: What resources would help you improve your presentation skills? 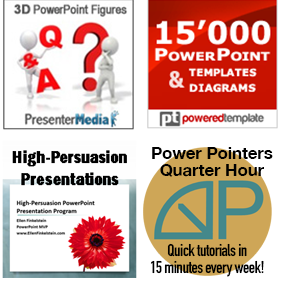 Which resources will help you improve your presentation skills?